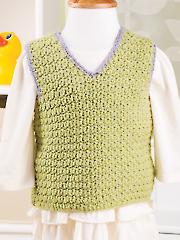 Knit the colorful Slip Stitch Vest with Amy Herzog or make the simple pullover Crochet Baby Vest with Marly Bird. 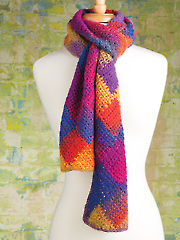 Brett Bara shows you the Crochet Entrelac Scarf. I made this slip stitch vest first sewing the front and back as the pattern directed, in size 2. Then I knitted the second vest on a circular needle recalculating the pattern so that the slip stitches would be correct, and I liked it better. The second was for a size 6. I really love this pattern. This was the sixth item I had ever knitted, and it made me look very professional. I hand washed the vests, and blocked them. My grandsons were very happy with them. I was very happy with this pattern until I ran out of Forest after completing only one armhole doing the 12-18 mos. size. I started on the slip-stitch vest tonight and the math doesn't work. I end up with an extra stitch on row 3. I'm making the smallest size. 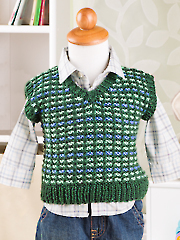 Also the pattern has a crochet hook size listed for a knit pattern and on the crocheted vest it lists a needle size 8. I love the show and really like the patterns and skill in them, but is anyone proof reading the patterns? 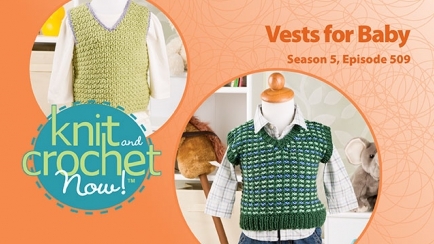 I'm really stuck on what to do, especially sense I bought yarn to make this vest. Saran - Thank you for letting us know about this error. We have corrected the PDF. It has been replaced on the site and is available for download. I record the show on Saturdays to watch at a later time, when I have the time. I like the items that were on today and I'm looking forward to making them. I suggest you put together a kit for the projects you have on so we can buy them with everything we need to make them.